I have been doing woodworking over 30 years and lived to tell about it. While waiting for the room to be advanced in construction far enough with all the rough in work, windows, electrical, and fire proofing foam which was sprayed before the insulation and drywall installation, I decided to design and build the two sink cabinets so that the plumbing could be completed. The bathroom cabinet was fairly straight forward with the exception of altering the top row of drawers to extend a few inches out beyond the lower section. This was a small detail that I had only seen before in my Dad's kitchens, who used to build his cabinets right in the house. I someday still want to build a set of kitchen cabinets that have this look and feel. In fact, I still have an experimental sample upper and base cabinet I built back around 1996 with an updated version of Dad's design. The other sink cabinet is also straight forward with the exception, two small sliding trays to hold dissecting tools in the drawers. Then I started drawing what I ended up calling, "The Mother of All Base Cabinets." This cabinet has 16 drawers to hold 3 by 5 index cards. 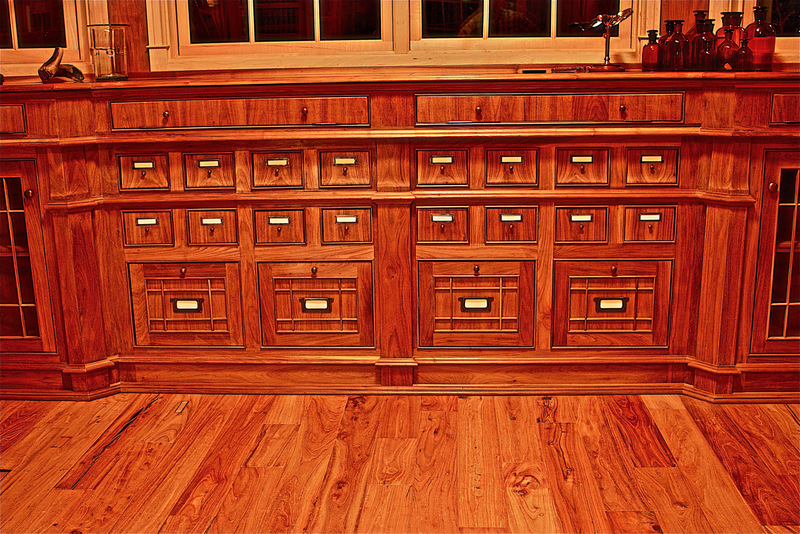 ( To be used for reference notes, not a book index) Four file cabinet drawers below and on the two wings, glass doors. Later I added a shadow box cabinet with glass top for displaying smaller treasures. The poplar secondary wood to hold the small drawers in place became quite interesting to build just by themselves. Keeping in mind the sketch on the long wall. The challenge was to build something that you feel will blend well with the overall feeling of the room. It doesn't have to be the exact same everything, but it needed to somehow tie in. This can be a tricky thought process. Sometimes it becomes more work thinking than the working part. But hey, what's a brain for? Simply amazing. Your work is beautiful. & that brain of yours isn't to shabby either :) we love reading your blog. Keep em' coming. super cool Jim. Keep it coming! I'm going to be quoting you quite often, "What is a brain for?" Love it!